Is there a favorite movie or show you’d love to bring into your big-night invitations? To get inspired, check out what I designed for this week’s creatively-minded muse, Dana Schiller. 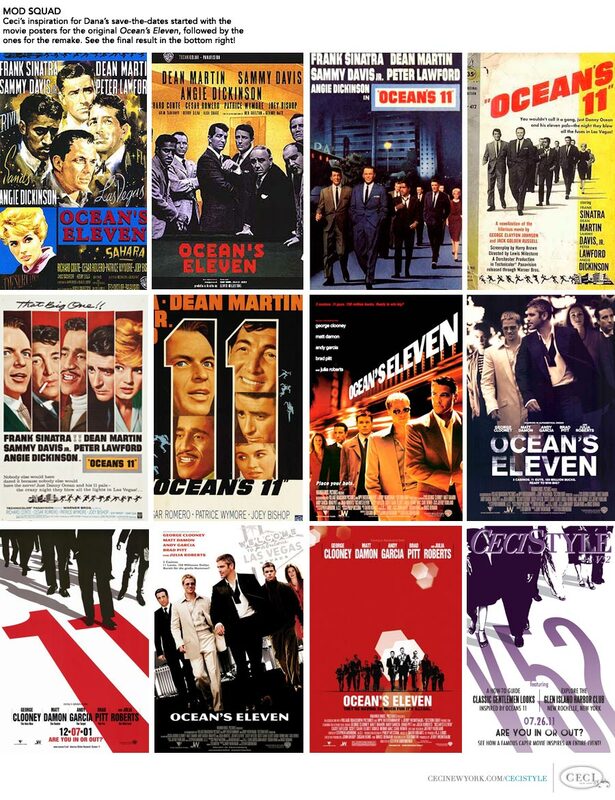 A playful nod to the movie poster for the Ocean’s Eleven remake starring George Clooney, Dana’s save-the-dates featured the film’s now iconic line, “Are you in or out?” Only in this case the question was asked of the guests, not the would-be casino thieves! The rest of the invitation was more traditional, but still hinted at the mod mood I had set with the first mailing. The wedding itself, which you can see below, had splashes of the same purple used on the invites, and surfaced everywhere from the bridesmaids’ dresses to the tablecloths at the reception. As you can tell, you don’t have to go overboard to have fun! Since the crime caper-loving Dana happens to be the in-house publicist for Brooks Brothers, I thought I’d take advantage and ask her to pass on some fashion tips for the men in your lives. She’s assembled five looks in all – each one based on a character from Ocean’s Eleven. How creative is that? Then, for those of you who want to make sure that all your guests hit the dance floor at your next party, there are plenty of great suggestions from DJ Jason Fioto of Generation Events. Now get busy dancing to your own beat!